With the Dow trading some 50 points lower today at 7120, earlier in the week, the 30 year veteran technical analyst, Robert Prechter announced both in his Elliott Wave Theorist newsletter and publicly on Bloomberg TV that he was covering his stocks bear market short position call that he recommended to subscribers over 18 months ago when the Dow was trading at 13,900. Robert calls this his best ever trade recommendation during his 30 year career, amounting to some 6,700 points on the DJIA and 800 points on the S&P. On Bloomberg TV, Robert Pretcher advises his clients to close their short positions and prepare for a possible strong spike higher as stock prices hit 11 year lows as investor sentiment indicators reached extreme bearish levels. However he also sees at least another 2 years for the stocks bear market before it bottoms due to the wave count and earnings fundamentals. Extreme investor sentiment indicators also point to a signifcant top in Gold and Treasury Bonds. In the latest issue of Robert Prechter's Elliott Wave Theorist, he outlines three markets that are on the verge of a major trend change, additionally subscribers to this months historic issue also gain access to the previous three month issues. Prechter is a perma bear, don't believe me ? Get a copy of his 1995 book On the crest of a Tidal wave, in which he builds up to his forecast why the Dow is heading for 400, instead the dow soared to 13,000 over the next 5 years ! LOL, if he is turning bullish then that means stocks will crash! I don't believe Prechter has made one dollar trading, only money making predictions on his website that is loaded with so many kinds of subscriptions you'd have to pay $10,000 a month to follow everything he's ranting about. 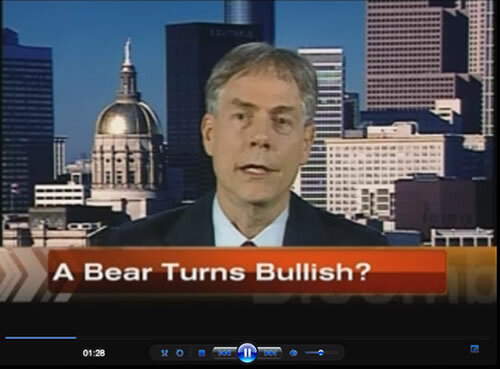 He's been consistantly bearish on stocks since june 2010, during which time the market has rallied more than 10%. It doesn't matter if he's ultimately right, anyone trading his advice on leverage is more than wiped out by now. Furthermore he has this massive deflation scenario that he's published books about and been preaching about since 2008, during which time the commodities have gone to the moon, silver is up nearly 200%. Gold double, Oil 300%, etc. etc. Again it doesn't matter if he's ultimately right or not, he's not made a single correct call and worse, his advice is totally around the wrong way.